Concerned about your health? Buy a pet. Pet ownership has been linked to human health benefits like lower blood pressure, lower cholesterol, and a better sense of well-being. According to the American Pet Products Association (APPA), 62 percent of American households own a pet and have spent a total of $53 billion in pet expenditures in last year. But as costly as this seems, many of us would agree that our health doesn't have a price tag. Human-animal relationships are pivotal in society as they encourage a level of intimacy, nurturance, and connection with nature. Now, studies are showing that the furry animals promote positive physical and psychological health in humans. It's time to sit down and read the 10 ways your pet can be your personal health aid. Dog walking is an excellent preventative measure against heart disease. A low-risk and low-intensity exercise, it can turn or keep your waistline slim as well as help you soak some vitamin D. Researchers at the University of Sydney found coronary heart disease could have been prevented among the nine percent of dog owners who currently have the condition, if they walked their pets more. A minimum of 150 minutes a week is recommended for dog owners to reduce the risk of heart disease. If you want to take your dog workouts a step further, look to yoga classes available for people and their dogs called doga. This style of yoga builds a deeper connection between owner and pet, promoting harmony and unity. The act of petting can relax and reduce stress levels due to the body's release of oxytocin, a hormone linked to emotional bonding. The owner and the pet releases oxytocin, which stabilizes a sense of calmness between the two. "The simple act of petting an animal is known to cause a person's blood pressure to drop," said Alan Beck, ScD, director of the Center for the Human-Animal Bond at Purdue University. Beck believes that the animal's heart rate slows down and blood pressure drops as does the owner's. People who suffer from fibromyalgia and chronic pain are recommended a Xolo, a Mexican hairless dog that can provide a healing touch with just a pet, according to Paws for Comforts, an organization that trains Xolos to be service dogs for people with chronic pain. These dogs have a body temperature of 102 degrees Fahrenheit and have the innate ability to know where their owner's pain is. The dog's body is placed on the hurting limbs of the owner and can even wrap itself around the neck of a person who suffers from chronic neck pain. 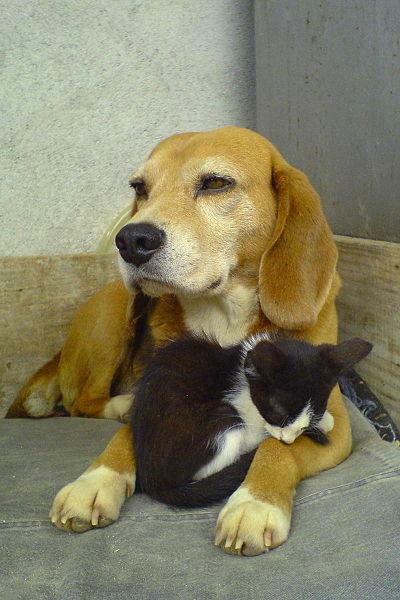 Pets provide companionship to individuals who live by themselves. Pet ownership among single people has increased by 17 percent in the last six years, reports the American Veterinary Medical Association (AVMA). The increase in pet ownership in families has only increased 1.37 percent. The study suggests that singles are more likely to see their pets as family members because of the amount of support that their companionship provides. Pet owners usually have the urge to socialize with other pet owners. Studies have shown that it is easier to meet people if you have a dog. These animals are seen as social ice breakers who are used a prop to stir up conversation with others. Dr. June McNicholas, senior research fellow in the Department of Psychology at the University of Warwick conducted a study to test the social catalyst effect of dogs. McNicholas spent five days with a dog and five days without a dog through her daily routines to record the number of times people, including friends, acquaintances, and strangers, stopped to talk to her. The results showed that the presence of a dog increased social interactions. Only a total number of three strangers spoke to McNicholas when she was alone compared to 65 strangers who approached her when she was accompanied by the dog. Pet ownership can boost self-esteem and self-worth. If you play with your pet you can raise levels of serotonin and dopamine and decrease cortisol, according to a study published in the British Medical Journal. Elderly individuals are shown to reap the benefits of animal ownership with 95 percent who talk each day to his or her pet, 82 percent who said owning a pet made them feel better when they were sad, 65 percent who said petting or caressing their pet made them feel better, and 57 percent who said they told their fears and worries to their pets in a survey of Elderly Pet Owners Regarding the Benefits of their Pets. People with pets live a happier, healthier, and longer life, reports a study. Researchers found that patients who were discharged from a coronary care unit and who had pets at home had a better survival rate for the next year compared to those who didn't. For those discharged, the thought of having a pet provided comfort, which, results show, could be associated with higher life expectancy. Exposure to a pet in infancy could mean the child is less likely to develop allergies and asthma. This stimulates the immune system to fight off infection at an early age. In Finland, researchers followed 397 kids from childbirth to age one as the families reported how much contact the tots had with a pet on a weekly basis. The results showed that animal contact at an early age leads to a stronger immune system that combats infectious respiratory illness. Higher levels of specific chemicals in the immune system influences a developed immune system that will keep tots healthier as they get older. Pets can teach children with attention deficit hyperactivity disorder (ADHD) to create a schedule and plan ahead. Pets need to be feed, walked, bathed, and groomed, tasks which need to be done on a timely schedule. Dog owners suffering from ADHD will learn to be calm, get exercise, increase social interaction and build up self-confidence. A study published in the American Journal of Public Health found that exposure to the outdoors could reduce attention deficit symptoms in kids. As a result, a walk in the park with a dog could be a remedy for a child who suffers from ADHD. People who live with diabetes could experience a drop in the level of glucose in the blood, leading to series health complications. There are dogs, however, that can pick up on the scent of chemical changes that the human body experiences moments before that occurs. Dogs for Diabetes is a particular organization that trains dogs to respond to serious blood glucose drops in the human body. Approximately one in three dogs who live with people with this medical condition have the ability to recognize these dangerously low levels. 10. Provide a healthy heart. Owning a pet can lend you a healthy heart. It will keep your blood pressure in check, lower your cholesterol, and reduce the risk of cardiac disease and heart failure. In a study, 240 married couples who were pet owners had lower blood pressure and lower heart rates compared to couples who were not pet owners. Cats have also been given four paws up for their ability to protect the human heart. Over the course of 20 years in a study, researchers at the University of Minnesota's Stroke Research Center found that 40 percent of people who never owned a cat were 40 percent more likely to die of a heart attack than those who did.